What’s Rhianna’s favourite cheese? Mozzarella-ella-ella. Apologies. Even as cheese jokes go that’s a shocker. 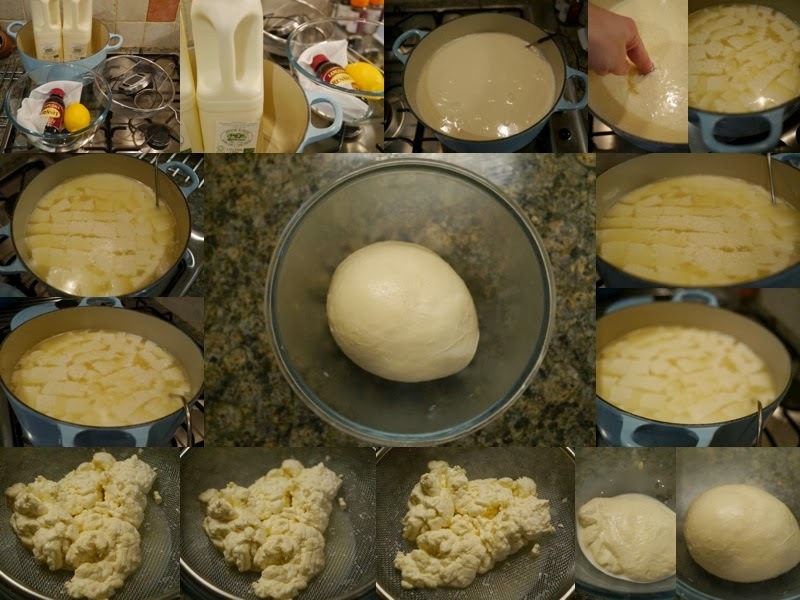 I’ve been wanting to make mozzarella for some time and inspired by the gents at Pizzicletta who are chuffed with the results of their own cheese making, I thought I’d give it a go this weekend. All things considered it was pretty straight forward. Two litres of milk yielded 200g of mozzarella so it wasn’t the most economical. The recipe suggested a yield closer to twice that but I suspect at least part of that was down to my own over exuberance in kneading the cheese and my excitement of seeing it come together. The plan then was to make re cook the whey to make ricotta, literally “recooked” in italian, and then make Gjetost, a Norwegian brown cheese from what was left over. This is where my beginners luck ran out though, the ricotta didn’t come together, and my brown cheese remained white. The Google diagnosis was that my whey was probably too acidic, not surprising given I couldn’t source citric acid powder so had guessed the lemon juice equivalent, one whole lemon proved in this case to be the incorrect answer, but you live and learn. That's gouda be the worst joke ever ; ) Takes about 80 litres of milk to make an 8kg truckle of stilton, so 2 litres of milk for 200g of mozzarella ain't bad. It's great that you gave it go!